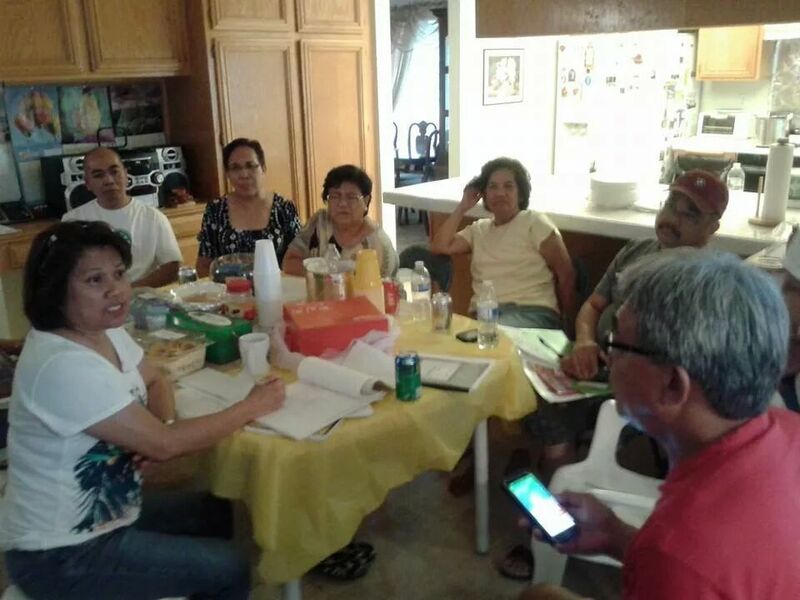 Meeting of the Cabatuan Association of California at the house of Sally Bilbao on August 2, 2014. From left, Mae Francisco, Nelson Caspe, Rosario Reboles, Nanette Tavarro, Sally Bilbao, Boboy Mosqueda and Jesus Tavarro. California, U.S.A. (August 17, 2014) - The Cabatuan Associaton of California will celebrate the fiesta of Cabatuan's patron saint, San Nicolas de Tolentino, on September 13, 2014 at Holiday Inn, 7000 Beach Blvd, Buena Park, CA 90620. Guest speaker will be Evelyn Miravite (Bernardo), the daughter of the late Atty. Lorenzo Fajardo Miravite and former Cabatuan Vice Mayor Avelina Vinluan Miravite. Her grandparents on the paternal side are Zacarias Continente Miravite, and the former Consolacion Legaspi Fajardo of Barrio Acao, Cabatuan. Her greatgrandparents are Bruno "Teniente Bunoy" Fajardo, a pre-war Teniente del Barrio of Barrio Acao, and also said to be a Teniente del Barrio of Barrio Salacay, Cabatuan; and Romana Legaspi, originally from Lemery, Iloilo. A picnic will be held the next day, September 14, 2014, at Palms Park Community, 12305 207th St, Lakewood, CA Sept 14, 2014. Last year's guest speaker was Evelyn's brother, "Bob" Miravite. Most of the members reside in Orange, Los Angeles, Riverside and San Diego. For more information, please contact Nelson Caspe, Jesus Tavarro, Mae Francisco, or Lira Corboy.